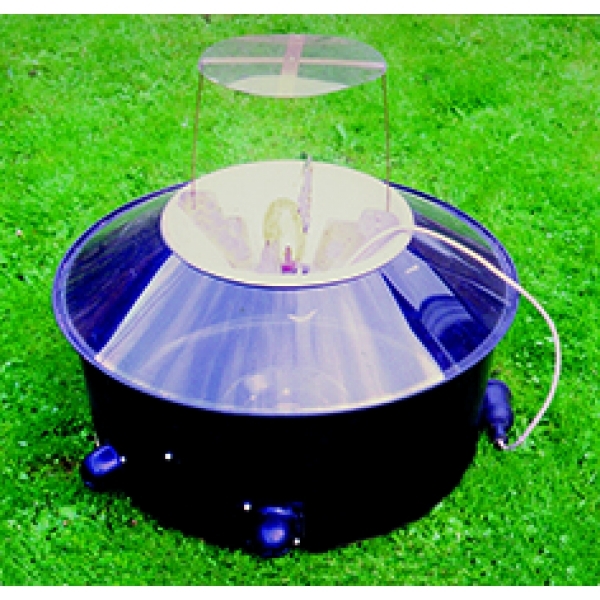 Where mains electricity is available, Mercury Vapour light is the most effective of all lights for attracting moths. Large numbers of moths and other insects will come to this powerful light. The Robinson Trap is a robust and well-built piece of equipment, made of rigid plastic and unaffected by rain. The MV bulb must be protected from rain, as it cracks if rain drops reach the bulb. The rain shield is only partial protection, so avoid use in windy and wet conditions. The trap measures approximately 50cm diameter. It comes with 50m of cable on a handy winder, and choke (essential for Mercury Vapour electrics), a spare 125W bulb and instructions. In remote places you need access to a mains supply or a generator. Mercury Vapour will not run from a battery. 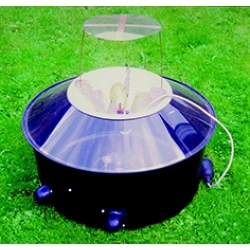 The Moonlander Moth Trap with the ultra-lightweight light, shown below, has been designed for use on holiday and foreign trips where there is no mains electricity and field trips where absolute portability is required. Estimated carriage may need adjustment for International destinations or British distant places and islands.